Yukon Gold potatoes are blended with spicy chorizo and mild queso fresco and then smothered with a fire-roasted gravy. Garnished with cilantro. Combine prepared Knorr® Brown Gravy with remaining ingredients and season to taste with salt and pepper. Simmer 5 minutes and reserve warm. Boil potatoes in water until tender; drain. Combine cooked potatoes with remaining ingredients and mash by handuntil mostly smooth. Top (6 oz.) 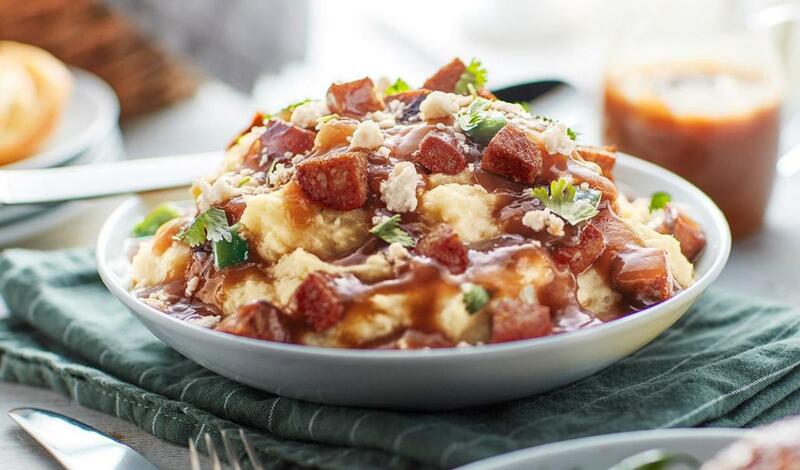 Yukon Gold smashed potatoes with (3½ oz. ladle) fire-roasted gravy, (1 oz.) diced chorizo and (½ oz.) queso fresco.